With all that was happening Thursday and Friday night I don’t have to imagine how tired you are, but the beat goes on. Rest up during the day on Saturday and prepare to dance pretty much non-stop Saturday night into next weekend. As I mentioned in my last post, the Prime Time crew (Eamon Harkin and James F! 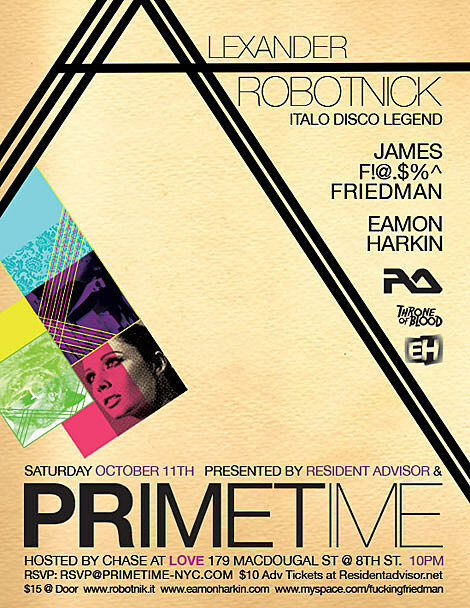 @.$%^ Friedman) are back at Love with guest Alexander Robotnick doing a special dj set/live show. As a pioneer of Italo disco who also has affinities for electro-house, -techno, and -disco, as well as acid & progressive house, and new-wave, his set is sure to be nothing short of interesting. You can download some of Alex’s mixes that touch on many of these styles here. Also be sure to check out Eamon Harkin’s recent releases on Wurst Edits – John Boy and (my favorite) Innit. You can stream the tracks on his myspace page…and Turntable Lab will hopefully be restocking the 12″ soon. Another party that’s sure to be excellent is happening just a little ways from Love, at Le Poisson Rouge. Surkin, one of the excellent young French deejays that have seemingly appeared out of nowhere and started cranking out great, updated yet retro-tinged new French dance classics (if you haven’t already, check out his Next Of Kin EP) will be deejaying. Para One, a Frenchman who is no stranger to our ears beginning production in 2000 and yielding a number of successful tracks and remixes (both for himself and an array of other artists) since then, will be doing one of his great live sets featuring enough knob-twisting and sonic manipulation to make your head spin. 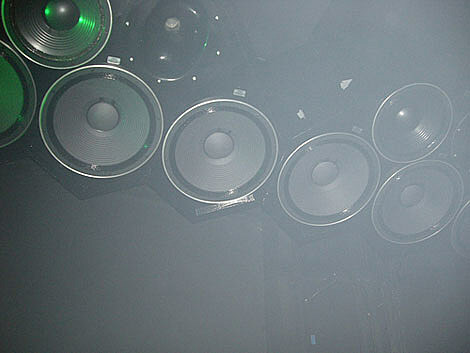 Hamburg native, Fukkk Offf rounds out the otherwise all French bill with a live set. Check out my post from earlier this week for more info. A third option that I am less sure about, but is still worth mentioning is Z-trip at Santos. 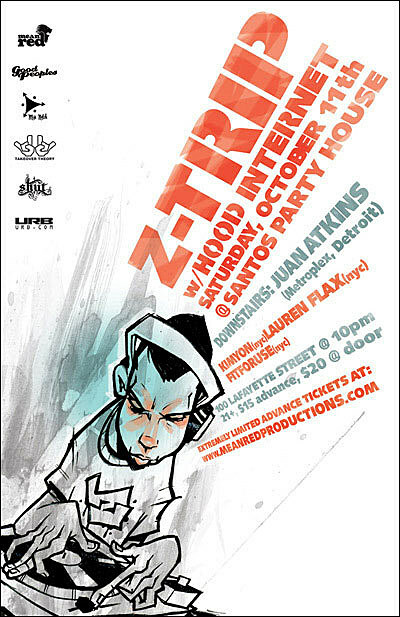 My reservations come from a Z-trip experience I had last year during CMJ, when I saw him open for MSTRKRFT at Studio B. You can read about it here, draw your own conclusions. To be fair…Studio B was hot as hell, and packed wall to wall which probably made me not the most receptive to hearing new music. There are tons of free downloads (both individual tracks as well as mixes) over at Z’s website to aid in your decision. Also, another big reason you might want to consider this event – techno godfather, Juan Atkins, is also on the bill as well as Chicago mash-up monsters, the Hood Internet (check out Waters of Naza(b)reath – yes, Beyonce vs. Justice, and other equally insane combos over at their blog). 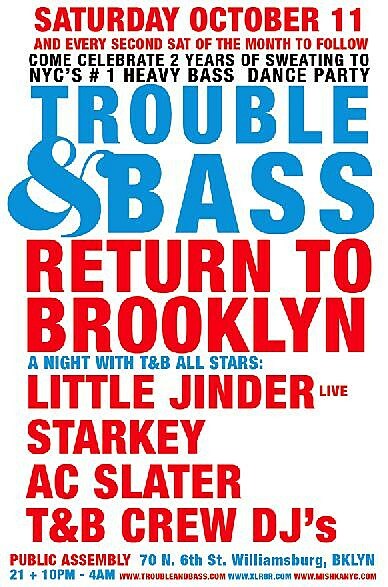 The Trouble & Bass crew celebrate their return to Brooklyn, where the T&B parties first started. In addition to the full crew (Drop the Lime, Mathhead, Star Eyes, and the Captain), they’ve brought in the Trouble & Bass Recording Allstars: Starkey from Philly, Brooklyn’s own AC Slater (whose remix of “the Stars” is going to be featured on Moby’s Last Night Remixed), and Little Jinder (making her debut US appearance). Trouble & Bass recently had a contest to remix Little Jinder’s “Polyhedron”. You can check out the winners and download the runners’-up remixes here. The party is in the back room of Public Assembly. It costs $5 before 1, $10 after. It’s also going to be a monthly, happening every second Saturday. – Felix da Housecat is at Mansion (formerly Crobar…). More info here. Check out his Beatport Top 10, and while we’re on Beatport, have you seen Moby’s open letter to EMI? – Nicky Siano is at Santos. – Studio B (the B, as I like to call it) is back with Boo! – a huuuuge dance party with a mind boggling number of deejays. More info here. – Spin the Vote – A Fundraiser for Obama, curated by Arthur Baker is happening at Santos. The line-up looks great! – Jamie Lidell (who was great at Summerstage) is at Highline Ballroom. – Ladyhawke & Bumblebeez had to postpone their shows due to visa issues, but Van She Tech will still be making their US debut at Santos. RSVP here for $5 reduced entry. Be sure to have a listen to their great remix of Das Pop‘s “Underground” on their myspace player. – Yelle and Kap10Kurt (whose Mission Complete single just came out last Tuesday in 12″ and digital formats) are at Webster Hall. – Girls & Boys is throwing the Yelle after party at Bar 13, featuring Tepr, Grand Marnier, Kasper Bjork, and Kap10Kurt. Free with RSVP to girlsandboysnyc@gmail.com. – Jamie Lidell is at Music Hall of Williamsburg. – Morgan Geist‘s record release party for Double Night Time (which came out in late September) is at Santos. Whew! I am tired just typing all of that, let alone going to it. Week 3 of October madness will soon be upon us (and then CMJ!). In the meantime or whenever you have a minute, I really recommend this book: French Connections: From Discotheque to Discovery by Martin James. While it’s 5 years old, it really paints an accurate picture of the events leading up to the emergence of French dance & electronic music. From the different “scenes” to the birth of labels to how many French artists (Mr. Oizo, Air, Daft Punk, Laurent Garnier, Cassius to name a few) first got involved in making music, it’s a very interesting read that covers a lot without being overwhelming, in a very logical and entertaining way. Give it a whirl and check back here for what’s happening on the dance floor next week!